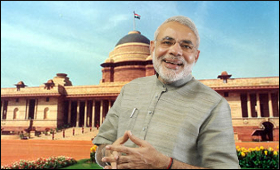 Prime Minister Narendra Modi will meet business leaders from India and Sweden in his Sweden and the United Kingdom for bilateral meetings and for the India-Nordic Summit and the Commonwealth Heads of Government Meeting during 17-20 April. PM Lofven and I will also have the opportunity to interact with top business leaders of both the countries and chart out a future roadmap of cooperation with focus on trade and investment, innovation, S&T, skill development, smart cities, clean energy, digitization and health. I would also call on His Majesty King Carl XVI Gustaf, King of Sweden, Modi said prior to his visit to Sweden and the United Kingdom. On 17th April, I will be in Stockholm on the invitation of Swedish Prime Minister Stefan Lofven. This is my first visit to Sweden. India and Sweden share warm and friendly ties. Our partnership is based on democratic values and commitment to an open, inclusive and rule-based global order, he added. On 18th April 2018, Modi will be in London on the invitation of Prime Minister Theresa May. I had last visited the UK in November 2015. India and the United Kingdom share a modern partnership bound by strong historical ties. My visit to London presents another opportunity for both countries to infuse fresh momentum to this growing bilateral engagement. I will be focusing on enhancing India-UK partnership in the areas healthcare, innovation, digitization, electric mobility, clean energy, and cyber security, Modi said. Under the theme of 'Living Bridge', I will also have the opportunity to meet people from various walks of life who have enriched the multi-faceted India-UK relationship, he added.